The summer of 69, my rather small LP collection would be enhanced with a copy of Blind Faith (there's really only one LP), because I had seen them live in July 69. And some Doors (by then,both the first and second albums, both of which I memorized the entire lyrics to). I wish I could recall just from where the Velvet Underground came into my peripheral vision. I was starting to become somewhat eclectic at the end of the 60s - moving on from Top of the Pops and into music that various folks were introducing me to. There was this guy (we are talking 13 years old) who was a friend of my younger brother's who was pretty well musically informed. He's the one who brought Are You Experienced our way and likely changed my musical perspective forever. I guess it must have been his infuence that led to our purchase of the Velvet Underground and Janis Ian - a long cry from the Motown that made up a majority of my LP collection. I confess: I was never really wild about VU: Yes, I recognize the "genius". Yes, I listened again and again ... but it always hit me as a little too hypnotic, too mesmerizing for true enjoyment. Maybe not enough joy. Kind of like what I imagine heroin might be like, and that's a path I never wanted to trod. David Bowie ... maybe ... Velvet Underground ...at arm's length. That said, 40 years down the road, I guess that is part of what drew me to Talking Heads. There is a lot of similarity in the repetitive style. And I still - at a distance - appreciate the Velvet Underground (and Bowie and John Cale and Lou Reed). Within limits. The live version above slightly more up tempo than the original on the eponymous album from '69, below. Emerson, Lake and Palmer were never a take it or leave it band. You were either on their bus or off it, at least when I was a boy and they were just beginning. It's funny, all these years later, wondering quite what the fuss was all about, their star having faded both so far and so fast. Even their erstwhile fans seem content to dismiss them as the stuff of youthful inexperience, with very rare ever a kind word said in retrospect. And I'm not even sure if this is it, but, hell, yes, I was on the bus. At my school it was all very simple. 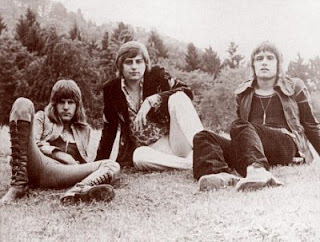 You either liked Yes or you liked ELP, strangely never being allowed to like both, which led me to missing out on a lot of music I only came to later. But the honeymoon had to end. The sheer exuberance of 'Pictures', the majesty of the first eponymous record and the inventiveness of 'Tarkus' were followed by the is-that-all of 'Trilogy'. Sure, I lauded it at the time I bought it, on the day of release, as bravado demanded, but the rot had set in. Not even the thrill of my first big arena show, at London's Earls Court, could hide the fact that 'Brain Salad Surgery' was an empty vessel. The dream was over and I bought the 'Yes Album'. So that's it, from the beginning, my all too brief infatuation with my first musical love. 3 or 4 years. Their legacy lives on with me, however. Unlike rather more fickle folk, I still have a yen for an occasional blast of 'Tarkus', side 1, or the whole of 'Pictures'. Or 'Lucky Man', killer end piece from the first record. I'm transported back to a mixture of acne and innocence. Let me finish with the title song for this scribble, ironically from 'Trilogy', perhaps the epitome of a Lake interlude, all vocal and multi dubbed guitars, before Emerson weaves in at the end, to remind that it's his group really. Of course the band played on. And on, becoming eventually what legendary DJ John Peel called, famously, a waste of electricity. Pity, that. As the end of the old year makes us think about those we have lost, the start of a new year makes us think of beginnings, fresh starts and new things, and thus the theme for the next two weeks. I’ve previously mentioned that the beginning of my concert going life was a Chicago show at the Saratoga Performing Arts Center with my parents. Chicago was one of the first bands that I called my favorite, and I will defend their early output as brilliant. After that though, they went downhill, and fast, to the point that they became a joke. Take their first 5 or 6, or even 8 albums, and they created a body of work that warrants their impending induction into the Rock and Roll Hall of Fame. Take their next almost 30 albums, and you have an impressive stack of mostly junk. I’m not going to get into a long analysis of what happened. I mean, listen to the first album—Chicago Transit Authority from 1969. Complex songs, long, interesting solos, intricate horn arrangements, political statements, and yes, some catchy tunes. As time went on, though, the balance between the complex and the commercial began to shift until, certainly by Chicago X, and probably sooner, there was little interesting, and lots of shlock. Whether it was the influence of Svengali producer James William Guercio, or an increasing desire by some band members to make a buck, or the changing music marketplace, or whatever, it happened, and that’s about where I jumped off the Chicago train, never really to return. And then came David Foster, and the guys from Toto, and a revolving door, and it really got ugly. But let’s forget all of that stuff, because it is forgettable, and just focus on “Beginnings,” from the debut. CTA was a double album, a rarity for a first album, and side one of the original vinyl has three songs—the aptly titled, “Introduction,” a jazzy, horn laden song, which then flowed into the piano intro to the great “Does Any Anybody Really Know What Time It Is? (wait—you don’t remember the piano intro? 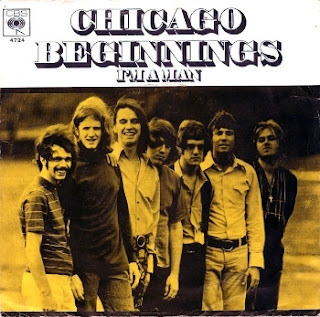 Because it was cut for radio play), which led into the guitar strum opening of the nearly eight minute long “Beginnings.” Written and sung by keyboard player Robert Lamm, it is a wonderful love song. It captures that feeling of the start of a relationship, when everything is exciting, time stops when you and your lover are together, and you want that feeling to go on forever. It expresses these emotions without being sappy or maudlin, and features great horn work, fabulous drumming by Danny Seraphine, and, yes, a nearly 2 minute Latin percussion fade out (wait, you don’t remember that? Because it was cut.....) “Beginnings” was the band’s second single and failed to chart. But in 1971, when Chicago was more popular and established, it was re-released, and hit #7 on the Billboard Singles Chart. It would be easy to analogize the new love feeling of “Beginnings,” a feeling that everyone knows doesn’t last, to the gradual crappification and critical rejection of Chicago, so I’m going to do that, because unlike Ike & Tina Turner, sometimes, I like to do something nice and easy. The question (not "Questions 67 and 68," the next song on the album, a personal favorite of mine, and from the number of times he played it on The Late Show, of Paul Shaffer’s), is what happens after that first heady rush of love cools down. Does it morph into a real, true, long-term love, like you find with people who are happily married for decades (like me! ), or with bands that you like forever, or does it flame out, and lead to separation, or giving up on a one-time favorite? When Chicago gets inducted into the Hall, there are going to be articles bemoaning their inclusion, and I get it—they have inflicted many, many bad songs on our ears since the mid-1970s. But before you join the hater bandwagon, listen to Chicago Transit Authority, from its “Introduction,” through the noise of Terry Kath’s “Free Form Guitar,” past the great cover of “I’m A Man,” to the overtly political last side, featuring samples from anitwar protests at the 1968 Democratic Convention and the searing nearly 15 minute instrumental, “Liberation,” and tell me that these guys didn’t begin their career with a masterpiece.